It’s finally October 1st! October 1st through the 31st is officially recognized as Breast Cancer Awareness Month, and we have the perfect pink themed decoration to decorate with. Introducing, our Think Pink Giant Car Bows! Our Think Pink Giant Car Bows feature a pink base along with a white lettering across each end of the bow that reads “Think Pink” on each side, and a breast cancer ribbon graphic. 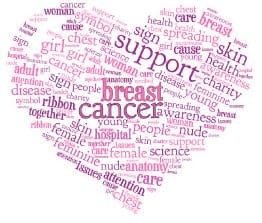 The tradition of using pink ribbons to represent Breast Cancer Awareness began in 1991 at the Race for the Cure in New York City. Our Think Pink Car Bows are designed perfectly for the occasion. The Think Pink Car Bows feature a scratch-resistant innovative soft magnetic base that will stay in place wherever you decide to place your car bow. Our bows are designed for both indoor and outdoor usage, so they are durable enough to withstand all weather conditions if needed. The car bows are made of sturdy and weather resistant vinyl. Even though our car bows are weather resistant and hard-wearing, they will not leave a mark on the surface you place them. You can attach our bows anywhere without worrying about paint chips, scratches, or any damage. If you want to customize your car bows, we can do that for you as well. Our car bows are available in multiple color themes in order to fit your every event need. Order our Think Pink Car Bows to keep your dealership looking great this October, and check out our other car bows for the upcoming months! It’s not too late, October has just begun! 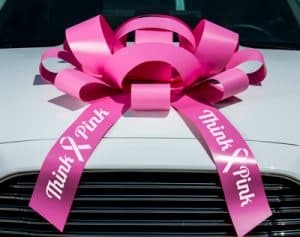 Hurry and order our Think Pink Car Bows so you can display them all month long. Get yours for the bargain price of only $36 per bow (minimum of two bows per order). Show your support for Breast Cancer Awareness Month and order online now!